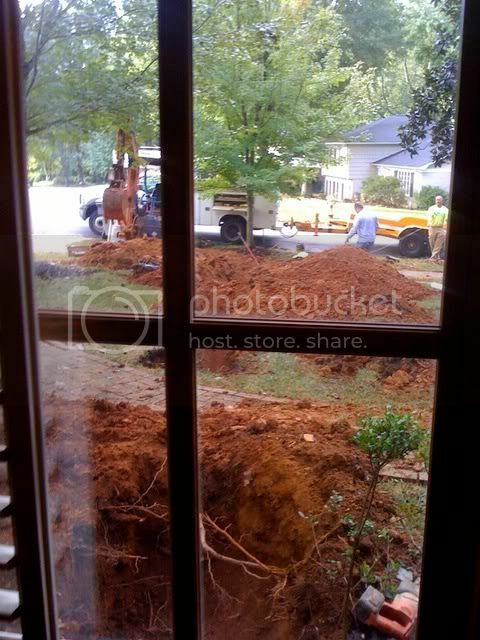 We're going on day three of replacing the mainline; this is the view from our front window. Sadly, I haven't even come close to doing any interior projects. As I eluded to on twitter, we have had a brutal first couple of weeks as homeowners. Plumbing emergencies, power outages, our bed doesn't fit upstairs (that is a whole other saga) and now a HUGE dead tree. We are just hoping the roof doesn't cave in this weekend! I keep telling myself that it will all be worth it in the end so I hope you'll hang tight because once the huge ditch in my front yard has been filled and all our furniture is inside, the real fun will begin!! So sorry you've had such a stressful few weeks. It will definitely be all worth it in the end! EEEEK! I hope things are going better for you lady! Thank you so much; I hope things take a turn for the better soon too! Oh I hope things go well. I have some major projects on my list soon. we'll have to swap our tearful stories! !